The advent of social networking has left a huge impact on the social set up and prevalent customs. For example, a decade ago who could have imagined that matchmaking will be done on websites and portals? The mere idea could have sounded like a joke at that time. But, today this is the very reality. Instead of wandering place to place, people prefer Matrimonial Websites and there are concrete reasons for this emerging trend. The popularity of Matrimonial Websites and the increasing traffic of them can be attributed to a number of reasons. Youngsters prefer to register on Matrimonial Sites, primarily because of the huge exposure that they derive on such platforms. Internet is ubiquitous and has a wide reach, both in terms of number and geography. As such, prospective brides and grooms find it convenient and a judicial way to have an online presence for matrimonial proposals. On the other hand, Matrimonial Websites contain extensive database of a number of aspiring brides and grooms. Thus, one has access to multitude options. 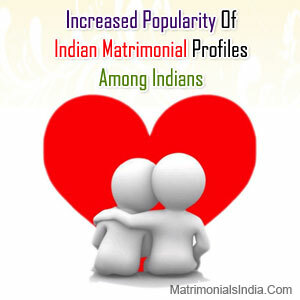 With the enormous growth in the field of social networking, Matrimonial Sites are also becoming popular among Indians. Matrimonial sites are so user-friendly that it requires a few steps to get registered and you can access these sites. In fact, marriage counselors and matchmakers also suggest people to consider Matrimonial Sites. Matrimonial Site is a platform where a registrant can involve his/her parents as well. The structural components of Matrimonial Websites too contribute immensely in their growing popularity. The user-friendly content, systematic categorization on various grounds, reliable information, etc, are some of the reasons behind successful run of the Matrimonial Sites. Indians have realized that Matrimonial Websites serve as the best platform where aspirant brides and grooms can interact and share their interests. No denying, Matrimonial Sites are the modern matchmakers in the Indian society.